We will be using an API - Application Programming Interface - to capture the screen we want. APIs call, or execute, Window's functions. They privide information and can access everything from memory, security, network, windows, registry and more. To use the API we will use today, we include/declare it at the top of the module. although ours is declared as Private, if you want to access an API from other modules you can declare it with the word Public, instead of the word Private. In Word, press ALT + F11 to open the VBA editor. 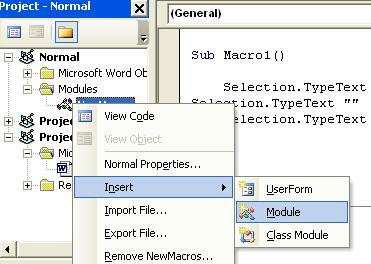 At the upper left, right click on the Module's folder in the VBA Project Explorer and insert a new module. After 3 seconds return to Word and click OK on the new message box to paste the captured image. "the active window will be copied to the clipboard." 1. Right click on any toolbar button or grey space in the toolbar. A long menu will appear of all the possible toolbars you could add to Word. 2. Click on the word Customize at the bottom. 3. If the Customize dialog box does not display with the middle tab Commands selected to the foreground, click on Commands. 4. Scroll down in the list on the left and select Macros. 5. In the left pane you should now see a list of macros you’ve created. Scroll down and find the row with screen capture VBA. For more advanced ways of capturing in Visual Basic, not VBA, see the article, "How To Capture and Print the Screen, a Form, or Any Window"